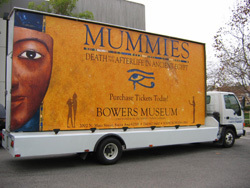 Our traditional 2-sided mobile billboards are the best in the business. We have the LARGEST area and consistently deliver your message right to your consumers. 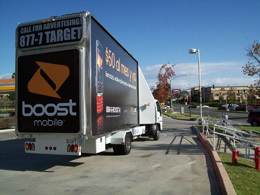 The 3-sided wedge mobile billboard has the biggest rear exposure on the road. With an extra-large backend, our Wedge billboard supplies the ultimate impact. The innovative Tri-Vision Mobile Billboard uses eye-catching rotational motion to direct onlooker's eyes right to your advertisement, capturing their attention. 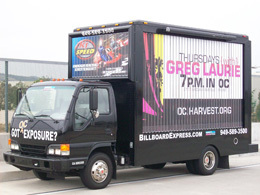 The three fleets of Billboard Express mobile billboards operate as billboards on wheels, transporting your large, eye-catching advertisements to exactly where your target audience is located, and when they are most likely to create the biggest impression. Click on a mobile billboard truck above to get more information. GPS Tracking - Our mobile billboards are equipped with a GPS Tracking system to provide proof of performance. When you contract with us for your advertising, we provide you with a proof of performance position report or you may view it live on-line. Our Drivers - Your message and reputation is reflected when you purchase advertising on our mobile billboards. You can trust that our courteous and professional drivers will deliver your message with the highest standards. Our drivers are all professionally trained.